As promised, here is the last Birthday Card I made using the Simon Says Stamp July 2016 Card Kit. If you would like to see this card close up, you will want to visit my YouTube channel because I have a video going up of the making of this card right now! That’s pretty much it! I really tried to stay with mostly using items that were included in the kit.I will continue to try to mostly use the items that are in the kit as well. I think it shows how versatile it really is. There were some great sentiments in the kit but I really needed Birthday Cards and it was lacking a Birthday Sentiment. Luckily I had other sets on had with some nice birthday greeting and most cardmakers have at least one set like this laying around. 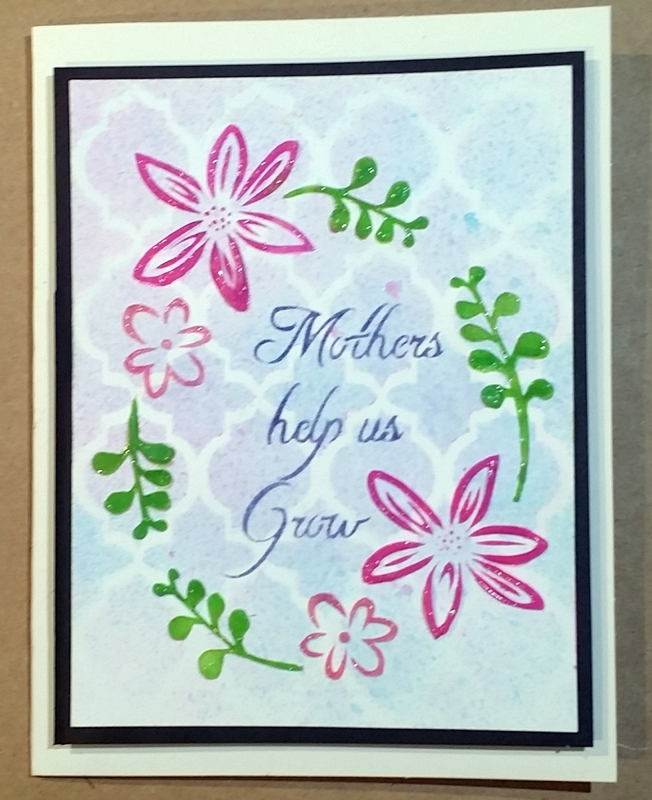 The technique I did here can also easily be done with a different embossing powder color and other watercolor mediums. You can use white embossing powder and watercolor pencils or even black embossing powder and zig clean color real brush markers. Just use what you have! Thank you for stopping by my blog and I will be back soon. Here’s my second birthday card that I made using mostly the items that were provided in the Simon Says Stamp July 2016 Card Kit. I started this card off using a piece of 4.25 x 5.5″ 120 lb white cardstock that was cut down from a 8.5 x 11″ piece that was included in the kit. These are a nice heavy weight cardstock and they take ink very nicely. They are also super smooth. I was again very impressed with the Simon Says Stamp paper. I inked up the cardstock using Salty Ocean Distress Ink, Peacock Feathers Distress Ink and the included Hybrid Ink in Slate Grey. Ink it in this order too. Ending with the darkest color just on the edges of the paper. I used a Tim Holtz Ink Blending Tool to get this effect. Dry the cardstock completely with a heat tool or leave it to dry. You need the cardstock bone dry so the next step works the best. Now you will ink up some of the solid image stamps from the Handwritten Floral Greetings Stamp Set using Versamark ink and stamp them to create a frame. Heat emboss them with white embossing powder. Don’t forget to use an anti-static powder tool before you do this! Here’s where the magic happens! Now we will color over the white embossed images with alcohol markers. I used Spectrum Noir Alcohol Markers to do this, but you can use Copics, BIC, Sharpie, or whatever alcohol based markers you have. This technique will not work with any other kind of medium since we’re essentially coloring on top of enamel. This creates these beautifully vibrant images on your card and it’s a really fun technique! Lastly, I stamped using one of my all time favorite stamp sets (Seriously, I find myself reaching for this one over and over again!) Handwritten Notes by Avery Elle. The “Happy Birthday To You” stamp was all in one line but all I had to do was selectively ink what I wanted on each line. Looking at the card now I wish I was a little more particular and slid the “To You” over to the left a little bit, but it still came out nice. I hope you give this technique a try and I’ll be back very soon with another Birthday Card using the July 2016 Simon Says Stamp Card Kit. 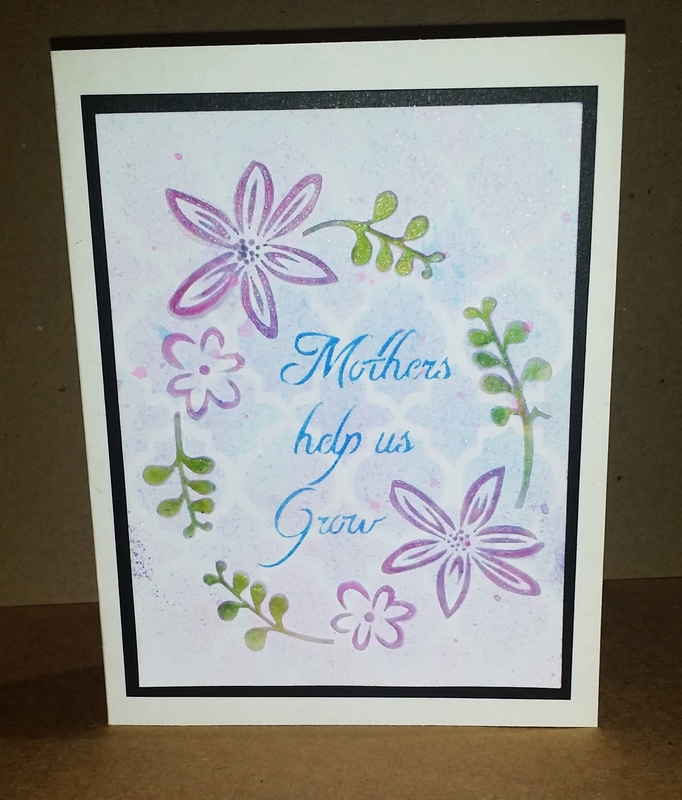 To subscribe to the card kit for $24.95 a month, just click the link below. 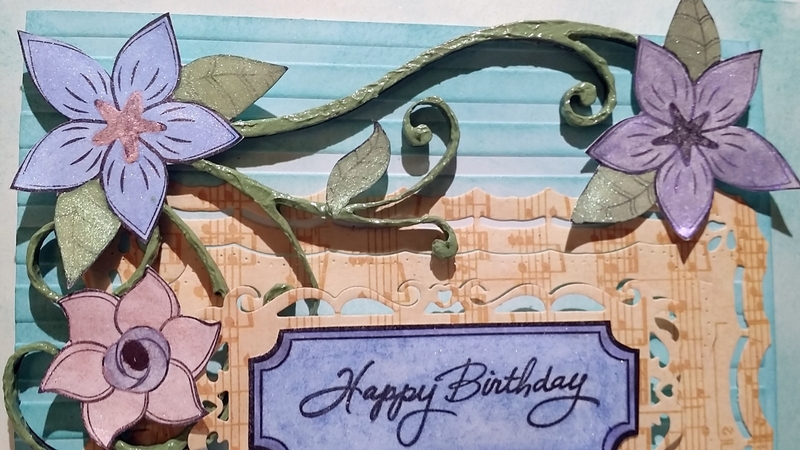 Today I’m sharing the first of 3 birthday cards that I have already made using this card kit. It tried to stick to mostly what was included in the kit and use only a little bit of my supplies I already had on hand. This was the quickest of all of the cards I made and I just made it up as I went along. I started with one of the beautiful patterned papers from the kit and ink blending the border and the flowers using a Judikins Color Duster. I used various yellow inks including the one hybrid ink that was in the kit along with some distress ink. 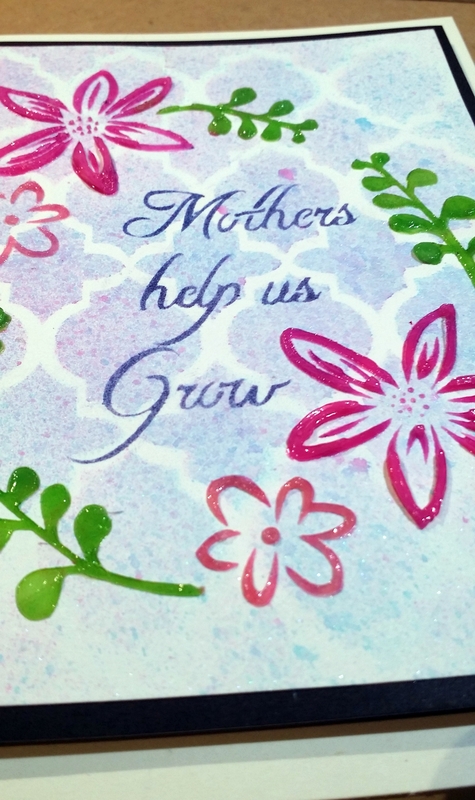 The sentiments that came in the Handwritten Floral Greetings Stamp Set were all nice but I specifically needed Birthday Cards so I used my stamp from the Lawn Fawn Scripty Sayings stamp set. I embossed that on some black cardstock using versamark and white embossing powder. Don’t forget to run an anti static tool over the paper before embossing! I layered that on top of some vellum and taped it down to the card front. I added some glass domes to the top left corner to finish it off. Glass domes are also sold by Pretty Pink Posh under the name Clear Droplets. Mine are just a little larger than theirs. I mounted the card front onto Simon Says Stamp Slate Cardstock that I turned into a card base by cutting it at 5.5″ and scoring it at 4.25″. If you haven’t used Simon Says Stamp Cardsstock before, I definitely recommend you give it a try. I was super happy with how heavy weight it was and it made me realize I’ve been making some very “light” card bases. It made it feel much nicer. That’s it for today! 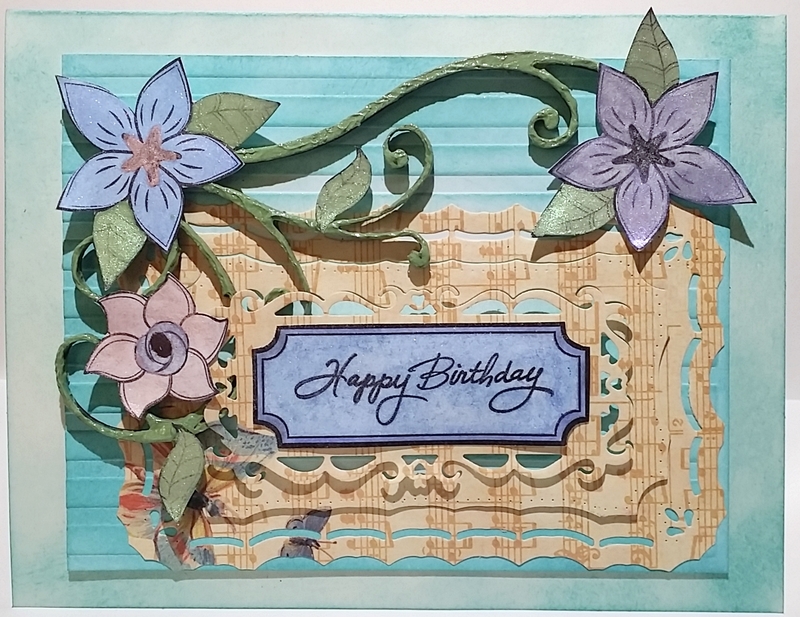 I will be back really soon with another birthday card I made using this month’s Simon Says Stamp Card Kit. Thank you for stopping by! I’m so excited! I have been waiting for a Simon Says Stamp Card Kit to come out that speaks to me. This one is it! They just revealed it and there is still time to get this kit at the $5 discounted rate if you sign up for the subscription! The card kit is $24.95 if you get it through the subscription. Just click the banner below to check it out! Sign up for the kit now and you can play along with me in July! I will definitely be making YouTube videos and blog posts using this card kit. You can also just get this one kit for $29.95 if you don’t want to sign up for a subscription. As you can see, you get eight double sided 6×6″ papers, a 4×6″ stamp set, FOUR Simon Says Stamp Inks, a water brush, five pieces of 8.5 x 11″ cardstock in various colors, and I think there’s some watercolor cardstock included too. I plan to do some embossed watercoloring, no line watercoloring, simple cards using the paper as the main focus, and I will be using my Silhouette Cameo 2 to cut out the stamped images to do some 3-D effects. I hope you will be playing along with me! This card was pretty time consuming, but I’m very happy with how it came out. I have a video on youtube of the making of this card if you are curious how it was made. Pretty Pink Posh Clear Droplets OR Glass Dome Seals from http://www.8seasons.com. The ones I used are actually 10mm and 15mm, so they are much larger than the Pretty Pink Posh ones. 8seasons.com is overseas and the shipping is not usually worth it unless you place a large order. The 10mm Glass Domes are only $2.83 for 100. The 15mm Glass Domes are $2.83 for 50. If you click the pictures below you can get 200-225 4mm clear droplets for $3.00 or 75-100 6mm clear droplets for $3.00. Not a bad deal. Another month has passed and another family member’s birthday has passed as well. I don’t know about you guys, but it seems like there is a birthday every month between my family and friends. There’s some months that I end up celebrating 2-3 birthdays! For me, April and May are the only months that I don’t have to make cards for, but of course I could make Easter and Memorial Day cards if I wanted to. I love that it means I absolutely MUST craft to make a card . Sometimes it’s a little hard to fit it in, but I try to make an effort to make them feel special on their day. She really liked it and says she wants to keep it! Of course, that is pretty much the best complement, since us card makers can’t even fathom the thought of a recipient throwing away our crafty gift that took us hours to make and we even were nice enough to use our special secret-stash-hoard items on. Yeah, you know what I mean! I hope you like the card as much as she did. Thank you for stopping by my blog! Hi Everyone! I tried doing some paper quilling a few months back on a card and I really didn’t know what I was doing. I had bought the Lake City Crafts Quilling tool at a crafting convention and didn’t really know what to do with it. When it was time to make a birthday card for my Step-Mom, I knew I wanted to try a different technique than I usually do. Then I remembered that quilling tool and started doing some research. I found that quilling boards can help you create consistent circles and then you can pinch those circles in certain ways to make different shapes. Once I did a little research I realized that paper quilling is not as complicated as I was trying to make it. There are some good websites online with free information to help you get started . There’s even a quilling forum! I plan on incorporating quilling in some of my holiday cards as well. Check out these quilled Poinsettias! After I did my research I decided that I really liked the flowers that had all of the perfectly sized petals and leaves. I knew that I wouldn’t be able to do that by ‘eyeballing’ it. I needed a quilling board, but I didn’t have enough time to get one online because I only had two days before the birthday party and I also didn’t want to have to search one out since I know quilling isn’t the most popular paper crafting technique. So, what’s a girl with a nice pile of wood, a computer , and a laser cutter to do? Design and cut my own, of course! My qulling board is about 6″ x 5-1/2″ and hasmany different size holes to chose from. It’s only $3.50! Buy it here on our website. I used the 20mm, 15mm, and 10mm circle sizes to make the card below. The larger flower on the left was a freehand technique that can also be done using pins and a corkboard.